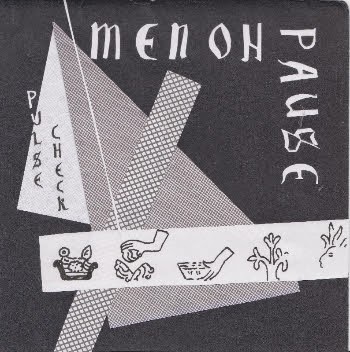 Forget C86 revivalism, there's a new sound in town, and it's called Men Oh Pause, who make the poppiest anti-pop this side of Young Marble Giants. This defiantly indie four-track ep from the often excellent Tuff Enuff shows Men Oh Pause resurrect the ghosts of Huggy Bear, Slampt!, Prolapse and several mid-90s US obscurities on the much-missed Troubleman Unlimited imprint. That's right - "imprint". Featuring Jacindy Cartland from King Alfred, Man Of Leisure, Maureen Bourne from Leopard Leg and Flo Brooks from Chaps, Men Oh Pause sound almost too cool, with their playground chant vocals, underpinned by an impending sense of doom and/or claustrophobia. "Sapphire and Steel" (named after everyone's favourite early 80s creepout sci-fio series) is the highlight here, a sinister Wurlitzer of a tune, that suddenly changes tack and turns into a growling drone pop delight. Imagine Free Kitten with a touch of the music hall. It's a heady brew alright.